Skyr is an ancient Viking cheese that has been a part of Scandinavian cuisine for centuries. It's a soft goat cheese with a creamy texture and pleasantly sharp flavor. Laurie and Terry Carlson of Fairview Farm Goat Dairy in Dallas, Oregon, make their own skyr using organic goat's milk from their small herd of Alpine and Nubian goats. The Carlson's raise their goats in a humane fashion, giving them high-quality feed, access to green pasture, and protection from predators. 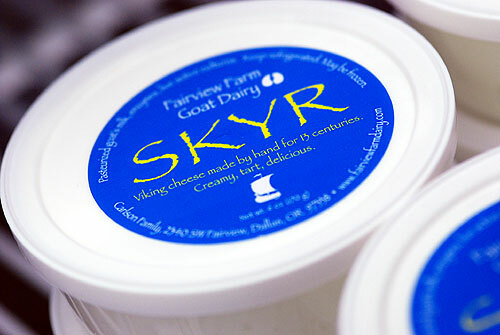 At Rafns' we are proud to offer Fairview Farm's delicious skyr, chevre, and goat's milk yogurt. They are world class products, and we think you'll love them! For more information, visit www.fairviewfarmdairy.com.